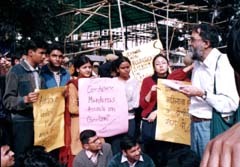 We consider the murderous attack on Prof. Syed Abdul Geelani, a teacher of Arabic in Zakir Hussain College, Delhi University, on 8 February, 2005, an assault on Indian democracy itself. Prof. Geelani's life has always been in danger ever since he was falsely implicated in the Parliament attack case and was subsequently acquitted of all charges by the High Court in Delhi. It is a matter of shame that the law-enforcing system of the country failed to protect an outstanding voice of democracy in India. Although we do not wish to pre-judge any specific complicity in the attack on Prof. Geelani at this stage, we strongly feel that the involvement of the Delhi Police itself, especially its Special Branch, in the crime can not be ruled out. It is clear by now that this Branch was in the grip of communal-fascist forces during the entire proceedings in the Parliament attack case. As with the other accused in the case, Prof. Geelani was falsely implicated on the basis of forged documents and concocted evidence. He was illegally arrested, brutally tortured and made to sign on blank sheets of paper by the officers of the branch. Attempts were made on his life inside the prison. Per the records submitted by his defence before the Supreme Court of India, he was constantly shadowed by the police throughout the country even after he was honourably acquitted by the High Court. Despite the torture and danger to his family, Prof. Geelani never submitted to the dictats of the police and, unlike the other accused, refused to sign the forced "confessions" written by the police. After his acquittal, Prof. Geelani has been a prominent voice in defence of democracy and human rights. Following his own bitter experience, he has drawn attention of the country to the abject violation of the rights of prisoners, especially Kashmiri muslims, in the Tihar jail. No wonder his presence has been a thorn in the flesh of cynical power enjoyed by the Special Branch with the undisguised blessings of the erstwhile NDA government in the name of anti-terrorist operations. We hope that, with the ouster of the NDA government, the atmosphere of fear and prejudice that engulfed the country during the previous regime will give way to genuine concerns about democratic norms, justice and human rights. We are aware of the promise of the UPA government to "preserve, protect and promote social harmony and to enforce the law without fear or favour to deal with all obscurantist and fundamentalist elements who seek to disturb social amity and peace." We are encouraged by your own statement in the Parliament that "the main tools of the UPA Government in dealing with terrorism would be dialogue, good governance, social justice, economic growth and the cooperation of the people." Click here to return to Parliamentary Attack Case & Gujarat index.